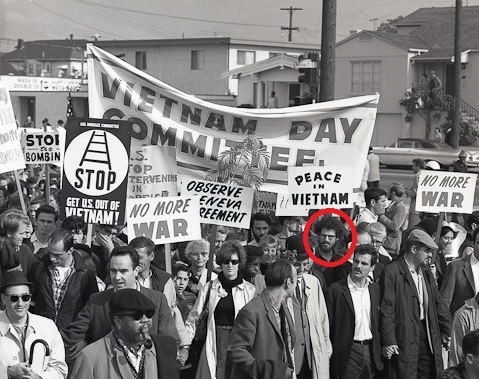 San Francisco photographer Eric Weill was identified as the man that called the Jim Dunbar show on the morning of Oct. 22, 1969 claiming to be the Zodiac, and called himself "Sam." You may remember this from David Fincher's movie as well. A man had called the Oakland PD the night before and told them he was Zodiac and that he wanted to speak to attorney Melvin Belli on the Dunbar show the following morning. In this video, you will hear audio of the call to the Jim Dunbar show as well as Weil's voice from an interview with rock legend Bob Dylan. Weill was in the crowd and got to ask Bob a couple of questions. In the photo, you see The Boot Hook, (1409 Polk St. San Fran.) placing the location of the photo approximately 1 mile from where Paul Stine picked up Z. 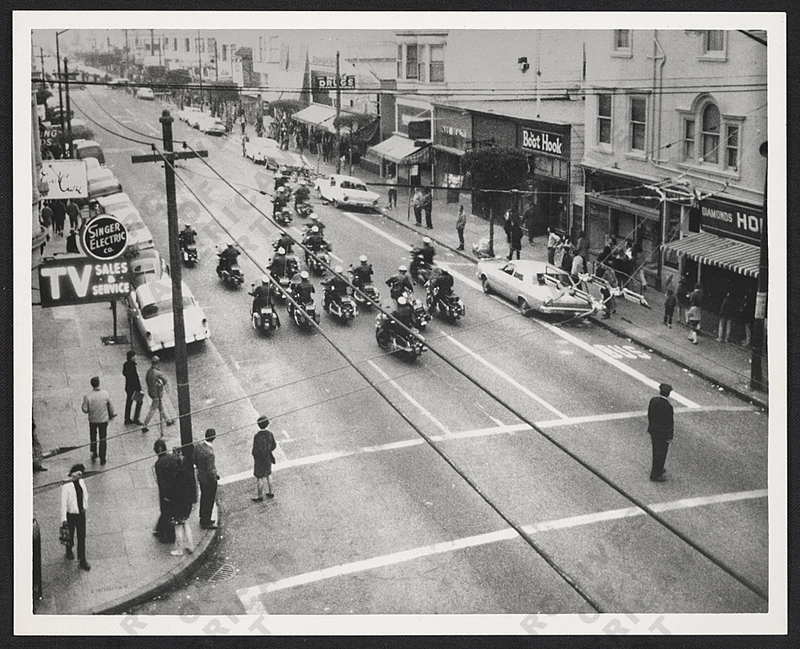 "Photograph shows a squadron of riot police on motorcycles driving down the road. Identification on verso (handwritten): Eric Weill." Notice that says Weill instead of Weil. Since it's impossible to find anything on Eric Weil, I have started looking for information on Eric Weill just in case, and bingo! Finally found the right guy. Siblings: Rita Phillips Weill (born January 10, 1940... Eric's twin. She married Michael Leo Byxbe in California June 15, 1973). The records I have seen say Eric was born in NY and his twin sister was born in Missouri. I think Eric may have been born in Missouri as well since the family lived there and then moved to Berkeley. Here is a funny 1949 article on the same Eric Weill from when he was 9 years old. He and his family were living in Berkeley at the time. This was in several newspapers around the country and even in Canada. How were Rita and Eric born the exact same day but in different states? The family lived in Missouri in 1940, so maybe Eric wasn't actually born in New York. The father, Sam, was born in NY so maybe the person who posted the info on the geneology site I was on posted Eric's state wrong. Just found that his sister Rita passed away in 2103 in Berkeley. She was a somewhat known singer with the Sweets Mill Music Camp. Here is a song by Rita from her 1968 album ""Rita Weill Sings Ballads and Folksongs." In discussions of some of the other POIs, you will see me make (or attempt to make) a connection between the POI and the Minutemen. I think there is a pretty good chance that the Minutemen, or at least one of their members, may have had something to do with the Zodiac case. Is their a connection between Weil and the Minutemen? I don't know. 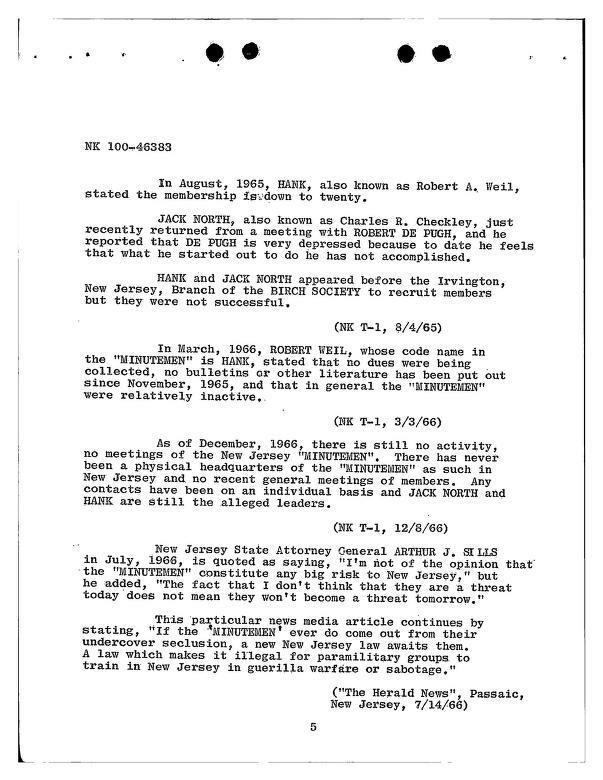 But there was a "high ranking" Minutemen member (in their New Jersey chapter) who shared the same last name. I have not found out if he was related to Eric or not. If he was, things could possibly get interesting. I think too many people have just laughed at the name of Eric Weill when his name is mentioned in the Zodiac case. Why? Just because he was a mental patient? How do we know someone didn't put him up to making that call? How do we know Zodiac wasn't in that same mental institution with Weill at some point and they maybe struck up a friendship? It's possible. Anything is possible. Too may people are quick to close doors with this case. I don't close a door until I am 100% certain that door can be closed. Until then, I at least keep that door cracked because something interesting or helpful might get through that crack and could lead to something. I wish Weill would have been looked into. Not as a Z suspect himself, but it would be nice to have a list of some of his friends and family. 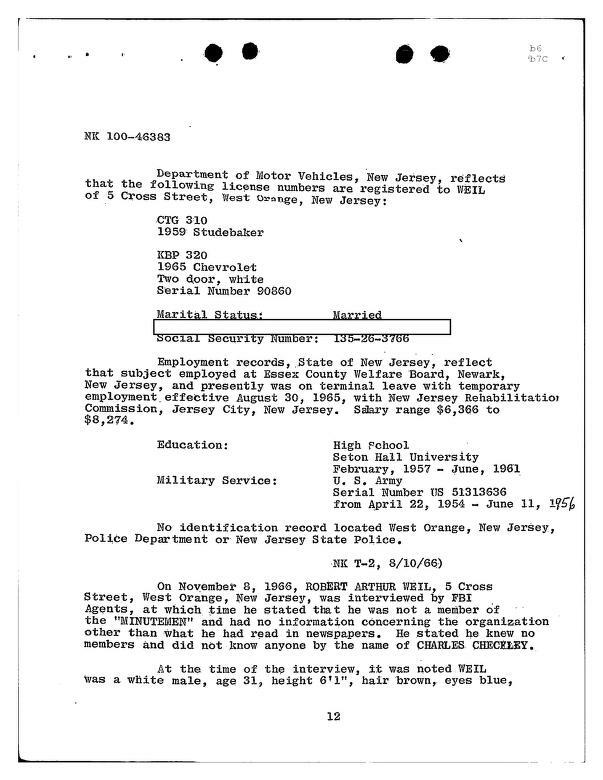 EDIT: I have a decent amount of information on the Weil who was in the Minutemen that I will post when I get my notes organized. 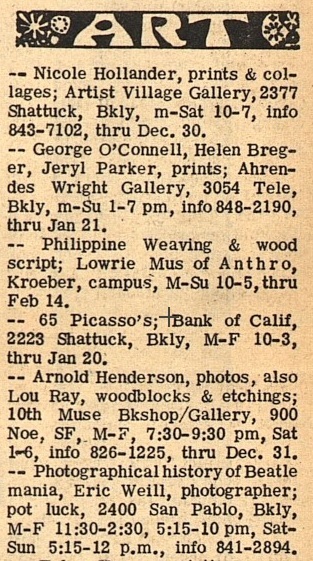 This is from the personals in the Berkeley Barb in June 1967. Right below it is an ad for someone selling "over $40 worth of Nudist Magazines"
Oakie style call Tex 549-1382"
How crazy would it be if "Tex" was Tex Watson? The address Weill left here is approximately 1.2 miles from where Paul Stine picked up his killer. "Years ago, a photographer named Eric Weill taught me to bring a BIG camera to political demonstrations, since it tended to make the police behave more reasonably. So when I got a call at 4 am one day that police were arresting students at Sproul Hall on the UC Berkeley campus, I put on a suit and a silk blouse -- nobody was going to call me a "dirty hippy", and took myself and my camera to photograph part of the Free Speech Movement, in the autumn of .. what, 1963? I immobilized a lot of police, since they put officers between me and those being arrested, but nobody bothered me, and I'm probably IN a lot of other photos of the event, since I took most of my shots from a ledge 5' off the ground on the south end of the building. I did hear rumors of people having negatives and prints stolen after the event, but nobody bothered mine. Not sure where they are, but they might surface and I'll scan them." 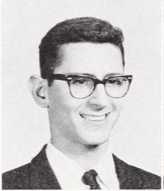 I found a 1960 Berkeley HS yearbook that lists Eric as a graduate assistant in philosophy. Can't seem to find a picture of him in the yearbook though. And there are pages missing so he might be on one of those. ophion1031 wrote: I found a 1960 Berkeley HS yearbook that lists Eric as a graduate assistant in philosophy. Can't seem to find a picture of him in the yearbook though. And there are pages missing so he might be on one of those. Wow, great job finding that. I think that is the first pic i have seen of him other than from the youtube video of him talking to Bob Dylan. Does anyone know if Eric Weill was most definitely the guy who called the Dunbar show? His voice sounds a lot different than his voice on the Bob Dylan video. Are there any documents saying he was the one who placed the call? Is his name mentioned in any FBI files? I'm sure there was a big background check done on him or maybe the police just disregarded him because he was in a mental institution at the time of a Z murder? I'm confused. I know a few people on the other Z sites had expressed an interest in Weill but the guy was a complete mystery. There was zero info on him on any of those sites. Now that there is some actual info on the guy thanks to ophion and galaxie, nobody seems to care. If the guy really was the one that called the Dunbar show I think he needs to be checked out further. If police determined he could not have been Z then ok but that doesn't mean he wasn't somehow involved with the thing. Did he make that call because he was batshit crazy or did somebody put him up to it? I'm not sure how it was determined Weill was the one who had called the Dunbar show. They must have been able to trace the call. Other than that I really don't know how he was identified or how/when his name was even made public. Citation: First hippie riot, San Francisco, 1968 / Eric Weil, photographer. Robert Fried papers, 1959-1975. Archives of American Art, Smithsonian Institution. Just found a photo on ebay of the Rolling Stones performing live that was taken by Eric. Just says it is from the 60's but no specific date given. Ringo Starr by Eric Weill in the late 60's or early 70's. Not sure if this is a painting or a photo Eric took or what, but the website I found this on sells it as a poster for $100. I'd assume it is a photo, but not too sure. Thanks!!! Must have overlooked this before. Looks like Paul but hard to tell. The other pic is harder to tell. The hair and facial hair look similar to Weill from the Bob Dylan interview video but looks like maybe something a little different with facial features. Good information on Eric and it explains why he was in a mental hospital. But I do not believe that he was the Dunbar show caller. I listened to both voices and they are not even close. I do however believe that Zodiac was the caller and gave some change to Weill and told him to make a few calls and was caught. I have heard the man who claims to be Zodiac and he is a match to the caller. He was smart enough to know how long it would take to trace a call and would hang up before it was traced. He had to have a lot of change to make as many calls as he did. Having that much change could be made into a weapon, so I doubt a patient would have that much? The mental patients at Napa did have week end passes and could go where ever they liked, but had to return by Sunday evening. 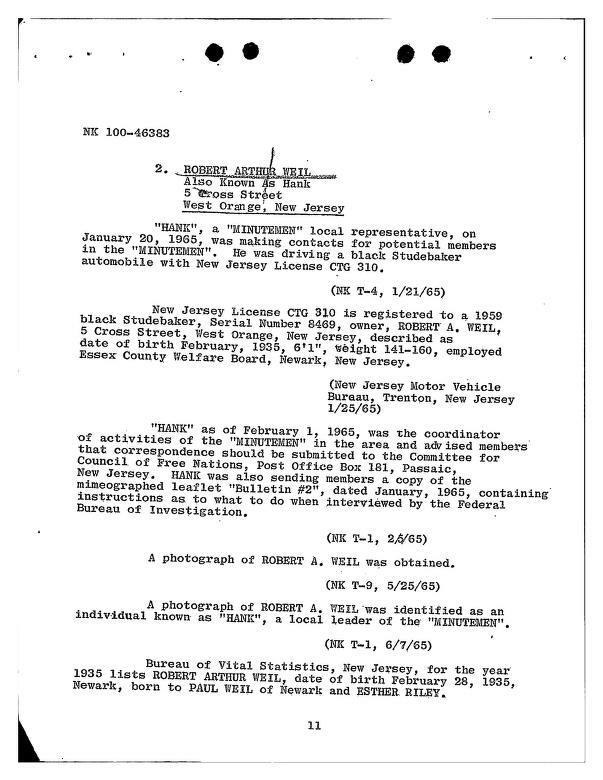 Weill was a patsy for Zodiac that day , is what I am very sure of. 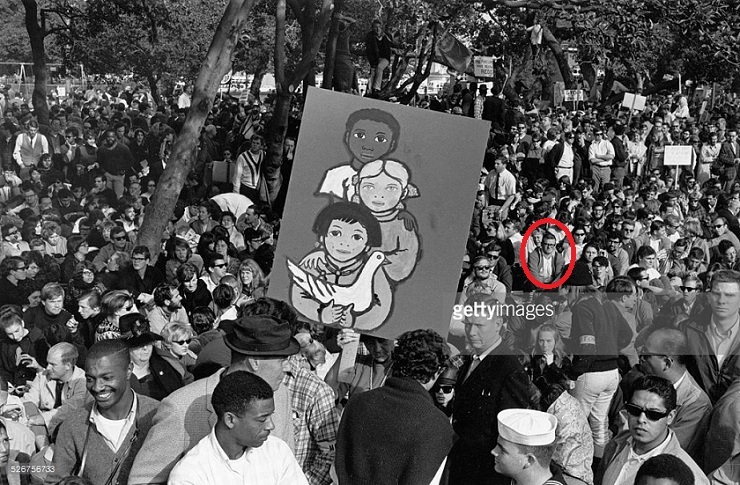 That picture in the crowd is close to Weill but not the same and the one who looked like Paul was not like any that I saw of Paul and I went to his school and saw a lot of his pictures. Yeah the voice is a lot different. How was it determined that Well was the caller to the Dunbar show? Do you think he knew Z and if so, in what capacity? Did Z convince Weill to call the Dunbar show if it actually was him that called? Is it for sure that the call came from the mental hospital? I wish I knew for sure how he was suspected as the caller. I did read that the calls came from Napa State hospital. In 1969 I was living a couple of blocks from that hospital. For some reason I thought that Weill called Belli's home and that was why they thought he had to be the same person that called from the State hospital, because he had been a patient in Napa at the time of the Dunbar show ? I wonder if the Napa Register had a article about that ? I will need to go to that library and see if it was in that paper or even in the SF Chron ? Anyone here have access to any of the newspapers sites? That would save me a trip to Napa.